Last post, we briefly introduced the concept of bond vibrations, and we saw that we can think of covalent bonds as a bit like balls and springs: the springs vibrate, and each one “sings” at a characteristic frequency, which depends on the strength of the bond and on the masses of the atoms. These vibrations have frequencies that are in the mid-infrared (IR) region of the electromagnetic spectrum. We can observe and measure this “singing” of bonds by applying IR radiation to a sample and measuring the frequencies at which the radiation is absorbed. 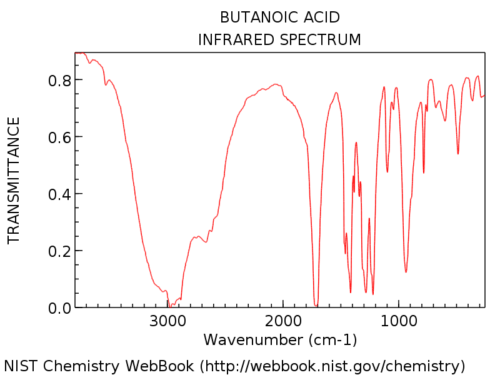 The result is a technique known as Infrared Spectroscopy, which is a useful and quick tool for identifying the bonds present in a given molecule. 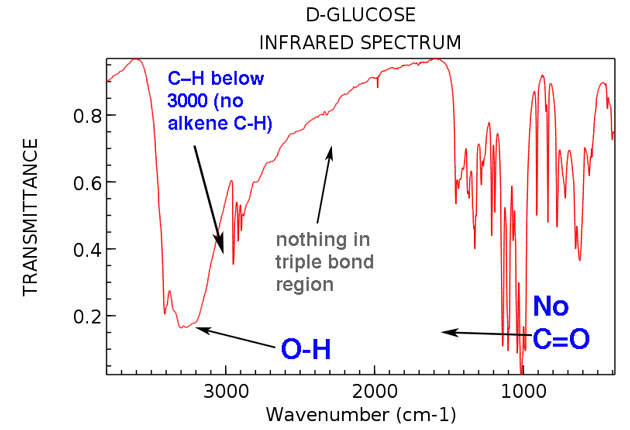 We saw that the IR spectrum of water was pretty simple – but moving on to a relatively complex molecule like glucose (below) we were suddenly confronted with a forest of peaks! Your first impression of looking at that IR might be: agh! how am I supposed to make sense of that?? To which I want to say: don’t panic! In this post, I want to show that a typical analysis of an IR spectrum is much simpler than you might think. In fact, once you learn what to look for, it can often be done in a minute or less. Why? We don’t need to analyze every single peak ! (as we’ll see later, that’s what NMR is for : – ) ). Instead, IR is great for identifying certain specific functional groups, like alcohols and carbonyls. In this way it’s complimentary to other techniques (like NMR) which don’t yield this information as quickly. With this in mind, we can simplify the analysis of an IR spectrum by cutting out everything except the lowest-lying fruit. See that forest of peaks from 500-1400 cm-1 ? We’re basically going to ignore them all! Bottom line: The purpose of this post is to show you how to prioritize your time in an analysis of an IR spectrum. Confronted with an IR spectrum of an unknown (and a sense of rising panic), what does a typical new student do? They often reach for the first tool they are given, which is a table of common ranges for IR peaks given to them by their instructor. The next step in their analysis is to go through the spectrum from one side to the next, trying to match every single peak to one of the numbers in the table. I know this because this is exactly what I did when I first learned IR. I call it “hunting and pecking”. The only people who “hunt and peck” as their first step are people who have no plan (i.e. “newbies”). So by reading the next few paragraphs you can save yourself a lot of time and confusion. In IR spectroscopy we measure where molecules absorb photons of IR radiation. The peaks represent areas of the spectrum where specific bond vibrations occur. [for more background, see the previous post, especially on the “ball and spring” model]. Just like springs of varying weights vibrate at characteristic frequencies depending on mass and tension, so do bonds. Here’s an overview of the IR window from 4000 cm -1 to 500 cm -1 with various regions of interest highlighted. Within these ranges, there are two high-priority areas to focus on, and two lesser-priority areas we’ll discuss further below. 3. The Two Main Things To Look For In An IR Spectrum: “Tongues” and “Swords”. Is there a broad, rounded peak in the region around 3400-3200 cm-1 ? That’s where hydroxyl groups (OH) appear. Is there a sharp, strong peak in the region around 1850-1630 cm-1 ? That’s where carbonyl groups (C=O) show up. First, let’s look at some examples of hydroxyl group peaks in the 3400 cm-1 to 3200 cm-1 region, which Jon describes vividly as “tongues”. The peaks below all belong to alcohols. Hydrogen bonding between hydroxyl groups leads to some variations in O-H bond strength, which results in a range of vibrational energies. The variation results in the broad peaks observed. Hydroxyl groups that are a part of carboxylic acids have an even broader appearance that we’ll describe in a bit. The main point is that a hydroxyl group isn’t generally something you need to go looking for in the baseline noise. Although hydroxyl groups are the most common type of broad peak in this region, N-H peaks can show up in this area as well (more on them in the footnote below). They tend to have a sharper appearance and may appear as one or two peaks depending on the number of N-H bonds. Next, let’s look at some examples of C=O peaks, in the region around 1630-1800 cm-1.. These peaks are almost always the strongest peaks in the entire spectrum and are relatively narrow, giving them a somewhat “sword-like” appearance. That sums up our 80/20 analysis: look for tongues and swords. If you learn nothing else from this post, learn to recognize these two types of peaks! Two other regions of the IR spectrum can quickly yield useful information if you train yourself to look for them. 3. The line at 3000 cm-1 is a useful “border” between alkene C–H (above 3000 cm-1) and alkane C–H (below 3000 cm-1 ) This can quickly help you determine if double bonds are present. 4. A peak in the region around 2200 cm-1 – 2050 cm-1 is a subtle indicator of the presence of a triple bond [C≡N or C≡C] . Nothing else shows up in this region. if you’re given the molecular formula, that will determine what functional groups you should look for. It makes no sense to look for OH groups if you have no oxygens in your molecular formula, or likewise the presence of an amine if the formula lacks nitrogen. Less obviously, calculate the degrees of unsaturation if you are given the molecular formula, because it will provide important clues. Don’t look for C=O in a structure like C4H10O which doesn’t have any degrees of unsaturation. Let’s look at a specific example so we can see everything in perspective. The spectrum below is of 1-hexanol. Note the hydroxyl group peak around 3300 cm-1 , typical of an alcohol (That sharp peak around 3600 cm-1 is a common companion to hydroxyl peaks: it represents non-hydrogen bonded O-H). 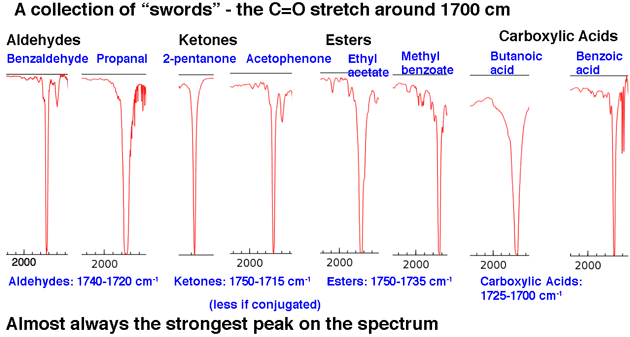 As you’d expect for 1-hexanol, there isn’t any telltale carbonyl peak around 1700 cm-1. Beginners might be tempted to label that dagger-like strong peak at about 1450 cm-1 as a possible C=O stretch. It is not. (it’s likely a C-H bend). Variations only occur within a very narrow range, and you are extremely unlikely to see a C=O stretch much below 1650 cm-1. The more spectra you see, the better you’ll get at making these judgements. 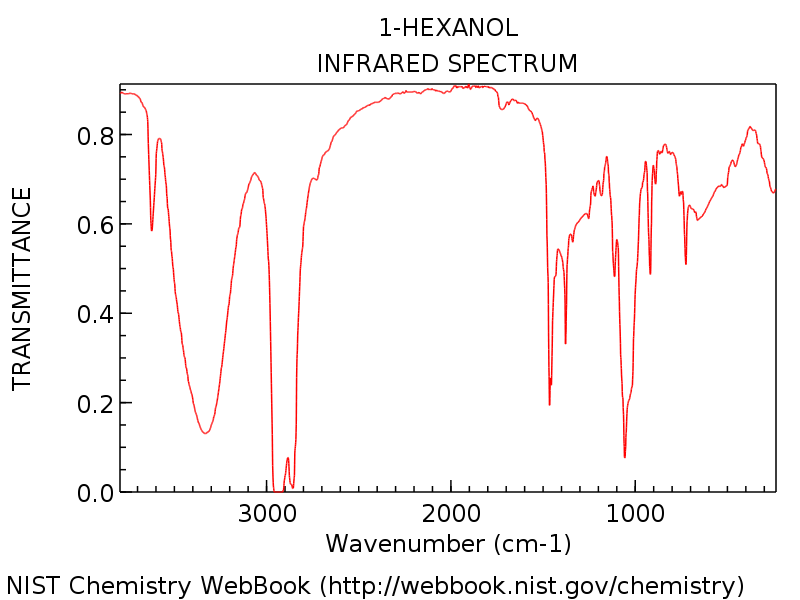 To gain some familiarity with variation, here’s some more examples of entire IR spectra of various alcohols. Hydroxyl groups in carboxylic acids are considerably broader than in alcohols. Jon calls it a “hairy beard”, which is a perfect description. Their appearance is also highly variable. The OH absorption in carboxylic acids can be so broad that it extends below 3000 cm-1 , pretty much “taking over” the left hand part of the spectrum. Here’s an example: butanoic acid. Here’s some more examples of full spectra so you can see the variation. The difference in appearance between the OH of an alcohol and that of a carboxylic acid is usually diagnostic. In the rare case where you aren’t sure whether the broad peak is due to the OH of an alcohol or a carboxylic acid, one suggestion is to check the region around 1700 cm for the C=O stretch. If it’s absent, you are likely looking at an alcohol. The second important peak region is the carbonyl C=O stretch area at about 1630-1830 cm. Carbonyl stretches are sharp and strong. Once you see a few of them they’re impossible to miss. Nothing else shows up in this region. 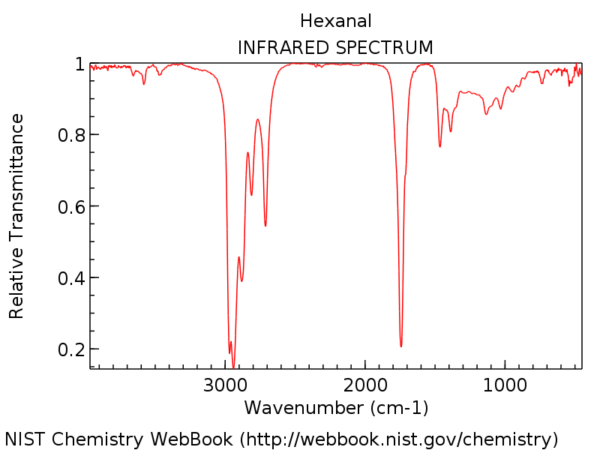 To put it in perspective, here’s the IR spectrum of hexanal. That peak a little after 1700 cm-1 is the C=O stretch. When it’s present, the C=O stretch is almost always the strongest peak in the IR spectrum and impossible to miss. Conjugation will affect the position of the C=O stretch somewhat, moving it to lower wavenumber. A decent rule of thumb is that you will never, ever see a C=O stretch below 1630. If you see a strong peak at 1500, for example, it is not C=O. It is something else. 6. Less Crucial, But Still Useful: Two More Very Diagnostic Areas. 3000 cm-1 serves as a useful dividing line. Above this line is observed higher frequency C-H stretches we attribute to sp2 hybridized C-H bonds. Two examples below: 1-hexene (note the peak that stands a little higher) and benzene. 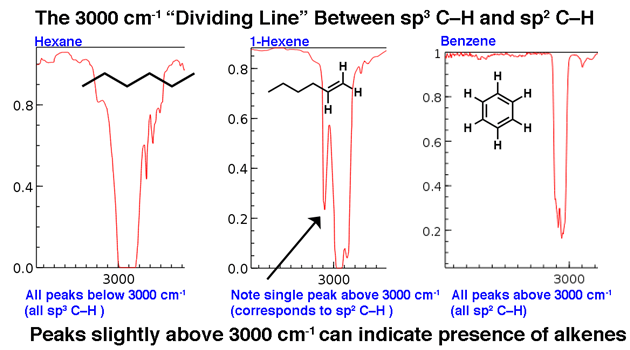 For a molecule with only sp3-hybrized C-H bonds, the lines will appear below 3000 cm-1 as in hexane, below. 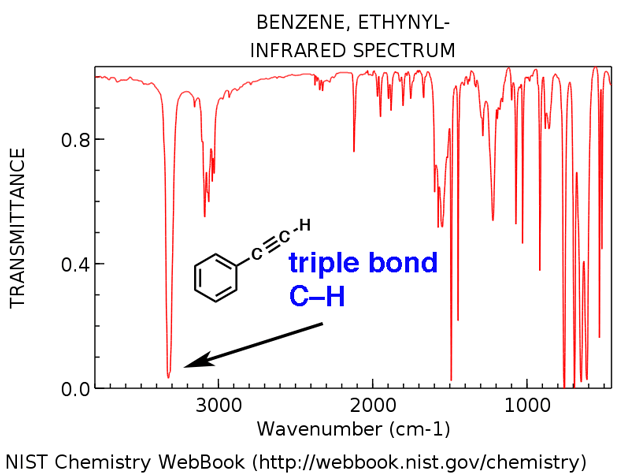 Molecules with triple bonds appear relatively infrequently in the grand scheme of things, but when they do, they do have a distinctive trace in the IR. The region between 2000 cm-1 and 2400 cm-1 is a bit of a “ghost town” in IR spectra; there’s very little that appears in this region. If you do see peaks in this region, a likely candidate is a triple bonded carbon such as an alkyne or nitrile. Note how weak the alkyne peaks are. This is one exception to the rule that one should ignore weak peaks. Still, caution is required: if you’re given the molecular formula, confirm that an alkyne is possible by calculating the degrees of unsaturation and ensuring that it is at least 2 or more. Terminal alkynes (such as 1-hexyne) also have a strong C-H stretch around 3400 cm-1 that is more strongly diagnostic. OK. We’ve gone over 4 regions that are useful for a quick analysis of an IR spectrum. Now let’s go back and look at the IR of glucose. What do we see? No C=O stretch present. No strong peak around 1700 cm-1 . (The peak at 1450 cm-1 isn’t a C=O stretch). Now: If you were given this spectrum as an “unknown” along with its molecular formula, C6H12O6, what conclusions could you draw about its structure? The molecule *likely* doesn’t have any alkenes. 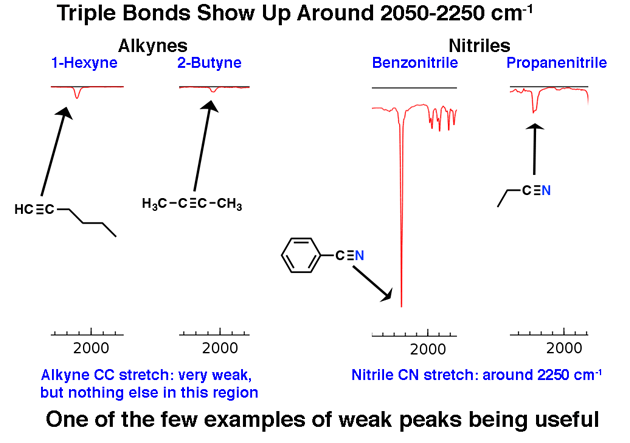 If any alkenes are present, they don’t bear any C-H bonds, because we’d see their C-H stretch above 3000 cm-1. A molecule with one degree of hydrogen deficiency (C6H12O6) but no C=O, and likely no C=C ? A good guess would be that the molecule contains a ring. (We know this is the case, of course, but it’s nice to see the IR confirming what we already know). 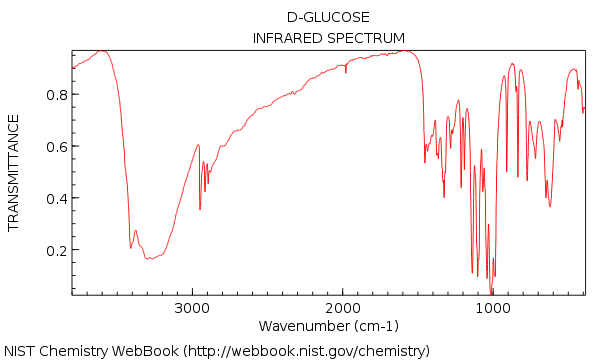 This is what a 1-minute analysis of the IR of glucose can tell us. Not the whole structure, mind you, but certainly some important bits and pieces. That’s enough for today. In the next post we’ll do some more 1-minute analyses and give more concrete examples of how to use the information in an IR spectrum to draw conclusions about molecular structure. [By the way: Jon Chui’s infographic on IR is much prettier than this post. Check it out]. Amines and amides also have N-H stretches which show up in this region. Notice how the primary amine and primary amide have two “fangs”, while the secondary amine and secondary amide have a single peak. The amine stretches tend to be sharper than the amide stretches; also the amides can be distinguished by a strong C=O stretch (see below). Terminal alkynes have a characteristic C-H stretch around 3300 cm-1. Here it is for ethynylbenzene, below. THIS IS SO HELPFUL!! so many different examples were used and I understand everything now! Will there be a quick tutorial for carbon and proton NMR as well? This is the best review for IR Spectroscopy out there! Thanks for such a great focused article. It’s really very helpful. Tried to make it useful. If it succeeded, great! I COMPLETELY AGREE 100% with the previous praises and comments – you have been a SAVING grace in my organic chemistry understanding and I appreciate your approach in simplifying the most complex things. I have honestly spent 4+hrs in attempting 2 problems in figuring out the structures and feel so much better moving forward. THANK YOU! Keep up the phenomenal job! I completely agree with the above posts. You should Youtube as well my friend. Great job! I do have a Youtube channel but it has been quite neglected! Best explanation of IR spectra I’ve came across. I know your faculty plans did not work out, but you are so better than many professors! Thank you! Never stop chasing your dreams! THANK YOU!!!! THIS SAVED MY LIFE!!!!!! If it made IR less painful, that’s awesome Alejandra! Excellent explanation! Thank you for all the hard work. Wow! Thanks – you will never know how much time this saved me. So glad to hear it Freeman. Thanks! This article saved me. Recommended this to all my friends. Thanks for letting me know Harshit! I was completely lost at lecture on IR but after reading this, i realized its simple things made difficult. You saved me a failure. So glad to hear it Josan. Best explanation ever ! The only one I understood .. Thank you a lot! Thanks Olivia! Glad you found it helpful! Look for the C-H bond stretch below 3000 cm-1. It is not specific for the aromatic ring but at least points to an sp2 hybridized carbon bonded to H.